ESPN and EpicTilt enjoyed a nice run of success last year with the free ESPN Cameraman ( ), a sports-themed take on the old Spot the Differences puzzle game. Because ad-supported games only go so far toward paying the bills, the cable sports network and iPhone app developer have teamed up again to produce ESPN Cameraman Deluxe. The sequel to ESPN Cameraman offers more features, as well as a $3 price tag. That Old Familiar Face: Like its free predecessor, ESPN Camerman Deluxe challenges you to find five differences in a series of sports photos before time runs out. Gameplay is unchanged from the free version. You’re given two photos from the world of sports, and you tap on the five differences—a missing logo, a blurred out number, a different colored t-shirt—in the allotted time. Identify the five differences, and you move on to another photo; run out of time, and you lose one of your three lives. You still get three hints, so use them wisely. The Deluxe version puts a different spin on the kinds of photos you see during the game. In the original, you got a mix of photos from across the sports world, but Deluxe lets you pick and choose from a variety of packs geared toward specific sports. Tap on the ones you want to download and play; delete the ones you have no interest in. (Beat it, Winter X Games.) You can choose to play Cameraman Deluxe with just a sport-specific pack, or you can tap on start and select up to three different packs if you prefer a little variety. What’s New: The Deluxe version lets you download sport-specific packs of photos. There’s also a news ticker at the bottom of the app’s home screen. Certainly, this kind of game only remains fun if the photos stay fresh, and new packs of photos arrive with impressive frequency. Since I downloaded the game earlier this month, a trio of college basketball packs have come available. And Cameraman Deluxe’s App Store page promises that a Women in Sports pack is on its way, along with a second Winter X Games pack. That said, the original ESPN Cameraman continues to receive updates—when playing that game this past week to compare it with Deluxe, I’ve noticed photos that weren’t there when I originally reviewed the game in January. It may well be that the Deluxe version receives more frequent updates, but is it $3 worth of frequency? Not that I can tell. Still, that’s not the only way Deluxe attempts to differentiate itself from its free counterpart. The app’s home page now features a ticker of recent sports news scrolling along the bottom. It’s somewhat current stuff, too—as I type this, the Deluxe ticker is displaying the score from last night’s World Baseball Classic games as well as some other recent spring training news. However, the ticker is for display purposes only—you can’t tap on a headline to get more details. For that, you have to tap on one of the game’s many links to ESPN.com—as in the original version, there’s a prominent ESPN.com button on the home page and if you tap on the “i” icon for each photo, you’ll get a caption and a link that launches a built-in browser for ESPN.com content. But there are a few significant changes—not all of them pleasant. 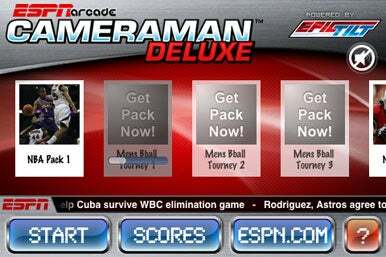 When you launch the browser in the original game, it maintains ESPN Cameraman’s landscape view; the Deluxe version, however, opens the browser in portrait view, forcing you to flip around your iPhone or iPod touch. More of the links also take you to a generic ESPN home page—in the original, tapping on the ESPN.com link from a soccer photo would take you to the site’s excellent soccernet.com mobile page, just as an example. These seem like backward steps, particularly for a paid app. The Deluxe version has one other prominent difference from the free ESPN Cameraman—the background music has been replaced with ESPN’s SportsCenter theme. Unfortunately, it’s a 30-second clip of the theme, playing in a repeating loop. This grows tiresome after, oh, about 33 seconds. If you opted to turn off the music in the original version—and I certainly did—you’ll set a new world’s record for turning off background music in this edition. ESPN Cameraman Deluxe is about as fun as the original version. But for a paid app, “as good as” really doesn’t cut it when you’ve got a perfectly acceptable free alternative. More photo choices, frequent updates, and a sports ticker are nice additions; they’re just not nearly enough to make me want to upgrade from the free original. 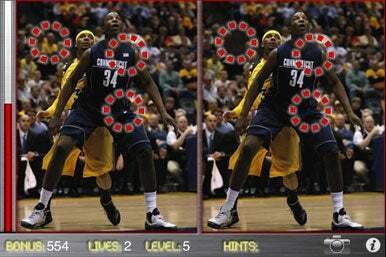 ESPN Cameraman Deluxe is compatible with any iPhone or iPod touch running the iPhone 2.1 software update.